“Our ideals – moral, social and poetic – must be defended with intelligence as well as emotion: and also with intransigence” – Lindsay Anderson. I am grateful to the organizers of this event for inviting me to deliver the Lester James Pieris oration for 2012. I am particularly grateful because it enables me to pay a well deserved tribute to a close and affectionate friend of over half a century. Indeed, Lester has dominated Sinhala cinema for the selfsame fifty years and perhaps a little more. He is one of the few remaining cultural icons in our country and is a giant of Asian cinema. Thank you Lester and our best wishes go to you. Since our friendship goes back a long time I would like to begin with a reminiscence of an early meeting with Lester. He had invited me to visit Balapitiya where he was shooting scenes for “Gam Peraliya” in the Mahakappina Walauwa. In those days film crews were on location for long periods and had time for much fellowship and special visits from friends, and particularly from the Producer who turned up from time to time to pay the bills and make sure that the Director, his players and the technical crew did not pave the way to his premature bankruptcy. I was lucky in that I had the privilege of making the journey from Colombo to Balapitiya in the company of Martin Wickremasinghe and Regi Siriwardena in Mr. Wickremasinghe’s car. I was too intimidated to participate actively in their discussions during the journey. Anyway, Regi was rather reticent probably fearing, as it is usual in films, that once the screen play is written the novelist is unhappy that some favourite parts are left out and new episodes added. To add to the tension was the frequently expressed view of Mr. Martin Wickremasinghe that cinema cannot do justice to literary works, probably based on his experiences with South Indian films which were than the main cinematic offerings to Sinhalese audiences. We were invited on that day because a key scene was being shot in Balapitiya. It was the marriage scene of Nanda and Piyal. We all crowded round the verandah of the Mahakappina Walauwa; out stepped the wedding couple and I vividly remember Lester deploying his new players from the stage, namely Tony Ranasinghe, G.W.Surendra and Wickrema Bogoda to give a sense of the festive occasion. There were also several foreigners in the crowd to suggest that Piyal was now building his fortune in Colombo. Crackers went off, a prop man tugged at an overhanging decoration and confetti floated down on the couple. When the film was released I eagerly looked forward to this scene, only to find that many of the details that stuck in my mind had been edited out. Nevertheless, I remember well Lester’s detachment; his whispers to the cameraman and very gentle suggestions he made to the players which became a hall mark of his directorial style. Since then we have had many pleasant meetings; many discussions. I also had the pleasure of seeing all his films from the documentaries he made for the GFU to his latest efforts. What holds his works together? What common thread binds his work? This is a legitimate question made contemporary by the Auteur theory which was first presented by the Cahier de Cinema group in France, and has today become a popular approach in understanding the work of cinematic giants. We look back at a large number of films of a Director all stamping a personal vision, a distinctive style and rhythm and, indeed, their cinematic language and idiom. After all if we could see in Picasso or George Keyt a distinctive vision and style, why cannot we do the same for the masters of the moving image? If we can delve into the psychology, even pathology of great painters and writers, the origins of their ‘oeuvre’, the influences on them, the effects of ideology and even of the market place and of the continuous evolution of their work, why cannot we follow the same methodology in examining the body of work of the great film directors of the world? Will it not help in separating the artist from the journey man? Wickremasinghe was a voracious reader. He read the Russion classics of Tolstroy, Dosteovsky Chekov and Gorky. That fed his inherent humanism which grew out of his close observation first of village life in South Sri Lanka and later of the metropolis of Colombo, which was being transformed by the beginnings of native capitalism. Lester on the other hand was a product of the English speaking Colombo upper middle class. His father was a well to do doctor. I was always intrigued by the appearance of a grave looking doctor in Lester’s films like Gam Peraliya, Nidhanaya and Madol Duwa, usually giving very rational and unhurried diagnosis, which only confirmed what the cinema audience already knew was a critical situation. Lester with his fascination with English literature and culture of the immediate post war period was part of the English “avant garde”. This was a group of people like Auden, Spender and Gascoyne who were transformed by the war and contemporary ideologies. It was an aesthetic movement based on humanism which shook the foundations of an out of date, class bound English culture. This is a long and fascination story which may be nearer to us than we think, thanks to many recent publications regarding this period. For instance, we read of Tambimuttu and his desperate efforts to help many of those talented poets even though he himself lived in abject poverty. It was not all poetry however. Due to the war effort British documentary films with their praise of the working man and woman, the young British soldiers, seamen and particularly the fighter pilots, created a new humanism – a regard for the dignity of the individual who faces great odds. This approach was seen in the work of John Grierson. Close to Independence, Mr. DS Senanayake was persuaded to set up the GFU. Its first equipment came from a group of Italians who had come to this country to shoot a feature film. Their producer had lost interest and the new government hired them to set up a Film Unit. With time the Italians left and the British took over. Fortunately they hired superb film makers like Ralph Keene who began to trawl London for likely assistance. 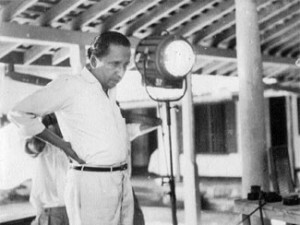 Many of those early film makers of the GFU like Lester James Peiris, Titus Totawatte, Hettiaratchy and Irvin Dassanaike had been involved in varying degree with film making in England and brought with them a sophistication and technical competence quite different from that of the Indian film industry. Also there were other associates like Sumiththa Amarasinghe, who had studied in India. Here is a quotation from G S Fraser’s. “The Modern writer and his world” which well describes the milieu in which young artists including those from Sri Lanka who were plucked out to come back to their country, lived. “I remember around 1946, young writers sharing sparsely furnished flats, giving parties with mulled Algerian wine and weak bitter beer, talking eagerly through the night, trying to call into existence, as if by magic, a ‘London Literary World”. I do not have the time to go into all the details of Lester’s pioneering ventures; the breakout from the GFU, Rekawa as the first authentic Sinhala film, the introduction of a new film language different from the prevailing South Indian tradition, his evolution towards a depiction of local, particularly Buddhist, culture and society and the first manifestation of Sinhala film in the regional and International critical arena. I will therefore devote the rest of my lecture to an examination of Lester’s cinema based on the Martin Wickremasinghe trilogy or triptych “Gam Peraliya”; “Yuganthaya” and “Kaliyugaya” which illustrates the director’s humanistic approach. I must say straight away that these three films have to be viewed as works of cinema and not mere translations of Wickremasinghe’s novels to celluloid. As John Hood remarks on a parallel relationship between Tagore and the cinema of Satyajit Ray, “I have discussed all these films, not according to their worthiness or otherwise as cinematic representatives of Tagore, but as cinematic works of art by Satyajit Ray. As literature and cinema are two categorically different art forms, there seems to me to be little point in decrying the independence of one and insisting on its difference to the other”. Unfortunately many of the critics of these films when they were released failed to understand such a difference. So it was also with Lester’s Baddegama which led to many controversies. Wickremasinghe’s three novels and Lester’s three films based on them cover four generations of a Sinhalese family group with origins in the deep south. Members of the family make the transition from a small village to the top of the country’s business ladder. It is a tale which resonates with Sri Lanka’s social experience and psychology. While many of our “Socialist” oriented critics have flayed a dead horse about the emergence of capitalism, as depicted in these novels, I would submit that it is the characterization of these “dramatis personae” that is most remarkable and is linked to the author’s close observation of and deep understanding of the complexities that go to make up their lives. It is only to appreciate the unique and complex nature of the behaviour of characters before us that we glimpse the undercurrents of social changes. Only an insensitive Marxist or an ultra nationalist will create puppets who appear and disappear according to the ideologue’s preferred vision. On the other hand, it is the sensitive interplay between the individual, his psychology and the evolving social background that makes for good art. “Sarachchandra writing The Sinhalese Novel in 1950 made this point about Gam Peraliya. He wrote “The Changing Village is a true tale of village life than anything that has appeared before. In its stark realism, it introduced us to characters whose attitude of life and mode of behaviour are unique. He presents these new types of humanity to us with a deep understanding of their psychology and the environmental conditions that served to produce such a psychology”. While the novel can always meander into anthropological and psychological commentary, a frequent technique of Martin Wickremasinghe, a film must perforce concentrate on event, action and character. As we see in the trilogy many of the subsidiary characters have been dropped and only key events have been highlighted. But it is a special characteristic of Lester’s cinema, as it is of Satyajit Ray, that the director has a good lining up of the sequences which enables the viewer not to stray too far from the original story. So does the composition of the visual images that go to constitute such a sequence. He is very restrained in his camera work, frequently using the mid-shot and using close-ups only for telling effect. In Gam Peraliya and Kali Yugaya it is the role of Nanda which is brought to the fore. It is Nanda whose dormant feelings for Piyal are squashed by the traditional mores. She accepts life with Jinadasa only to be buffeted by a series of, perhaps inevitable, events caused by changes in the wider world. In Kaliyugaya, which to me is a much better film than Yuganthaya, she is married to Piyal but a letter from her first born, Alan, from London cruelly gives a different “take” on the life that Piyal has created for his family in Colombo. By any standard the playing of Punya Heendeniya in these two films is outstanding. She brings an emotional charge to her role that keeps the viewer transfixed. As a director, Lester must be given full credit for focusing on the playing of this central character. The nuances of feeling of Nanda surrounded by people who have strong and simple feelings like Anula, Piyal and Savimon Kabalana not only makes her a sympathetic character but also takes us to a world of moral choices and sensitivity of feelings which help us to take a more tolerant view of the human condition. Who are we to pass judgment on such people who grapple with their own existential conditions? Lester’s compassionate but unflinching vision helps us to celebrate the wonder of human life. I am reminded of John Hood’s description of Ray “Quite apart from his artistic and technical brilliance, he was a film maker who celebrated humanity”. In both Lester’s films it is the woman Nanda who is the focus of attention. It is a mark of genuine humanism that he does not magnify her virtues nor overlook her blemishes. To quote Hood again, “The director reveals his characters frailties almost as reasons for loving them, while his concern for what is known in art as ‘realism’ is none other than a respect for truth”. Yuganthaya on the other hand has been dominated by the towering presence of Gamini Fonseka as Savimon Kabalana. Linked to Piyal and Nanda through marriage to their daughter Nalika, Kabalana has built up his business empire with a ruthlessness characteristic of primitive capitalism. He too has rural origins but by the time the film begins he has reached the pinnacle of success and wants his elder son, Malin, to succeed him. In this he is cruelly disappointed because the London returned Malin, like Samasamajist leaders, disowned their fathers as well as their wealth. Here too Lester uses Martin Wickremasinghe’s insights personally observed, while being a journalist in D R Wijewardena’s Lake House, to build up the character of Kabalana. Yet he too has his virtues, as Malin acknowledges. Finally he is vanquished by the very person who was closest to his heart, his son and in the last close up of Gamini, Lester gives us a view of the agony of a father’s incomprehensibility. This close up reminded me of the close-up in Eisensteins “Battleship Potemkin”. In the final scene we see the red shirted Malin being carried on the shoulders of the victorious workers. We are left with the question – is this the dawn of a new era? Or is Malin only a naïve do-gooder – well educated but with no real hard and bitter experience that characterized his father’s life? Are the workers genuinely fond of the boss’s son or is it only play acting by a group of ignorant opportunists who only want to dismantle an efficient economic machine so that they can get more pay and less work? Lester dangles the question before us: Is this a new beginning for the Left? Unfortunately as real life events unfolded somewhat later in time, it was only the beginning of the end.